Does Your Porsche Have an iManual? We get a lot of questions submitted to us here at FlatSixes.com. Some technical, others not so much. One of the most frequent is, "How do I properly close the hood or trunk of my Porsche? Do I push down on the badge?" A quick online search will show you a number of conflicting opinions found in various forums, on blogs and from other Porsche "experts". 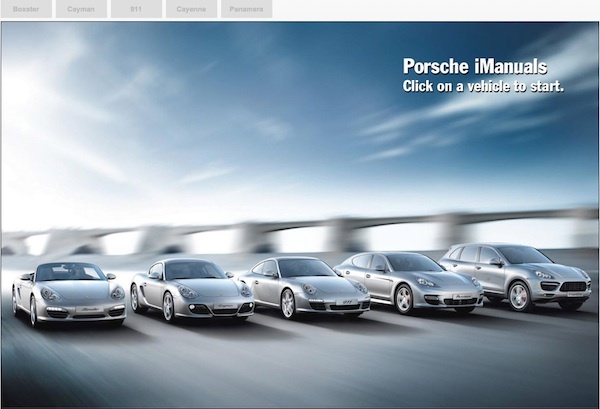 Fortunately, Porsche themselves answers this question, and many others on their iManual site. Even better, they answer a number of questions in video format like the one below. As always, if you can't see the video in your email simply click on how to close the trunk or hood on your Porsche to watch it directly on our site. The site is fairly new and only covers current models. However, there is quite a bit of "ever green" material on it that is pertinent to lots of different model years. We asked Porsche if there were any plans to go back further and they said no. However, it should be kept up to date going forward and the new 911 should come on line in the next few weeks. Take a few minutes and check out the site. You just might learn something! Porsche’s US Sales Continue to Increase. I recently purchased a 1997 993 cabrio. I did not get the owner’s manual. I have an owners manual for a 1996 993, but there is no information specific to cabrios. Does anyone know if there is a specific “insert” or whatever that may have come with the orignal package of manuals? Guy, welcome to our site. We’ll look around and see what we can find. As this post is a few days old, you might not get a ton of responses. We have a ’97 993 C4S and while I don’t have the manual in front of me, I think I remember that it covered the operation of the cab top as well. There are only minor differences between the cab and the coupe, so Porsche just combined them into one operators manual. This has puzzled me ever since I bought my 996 40th Anniversary car used in 2013! Their was no luggage with the car and the previous owner had no idea where it was also! The car dealer that he bought it from had the same result! My question is where do you find the luggage and price should you pay for it! It should would be an asset to the car looks when you open the trunk at show’s and etc. Thanks for your reply-Bob.